Want to follow our adventures? Find us on Facebook, Instagram or Pinterest! Great news! I finally found a way to fix the comment section so now anyone can comment easily without glitches or crashes - and that's whether you're on a phone, tablet or whatever technological device you use to browse SIL! I was so super excited, I thought we should celebrate with a chocolatey treat! These chocolates were actually a very happy accident. At first, I thought they were a fail - you can see the sugar set on the sides on the chocolates in the photos, rather than mixed through and dissolved completely. 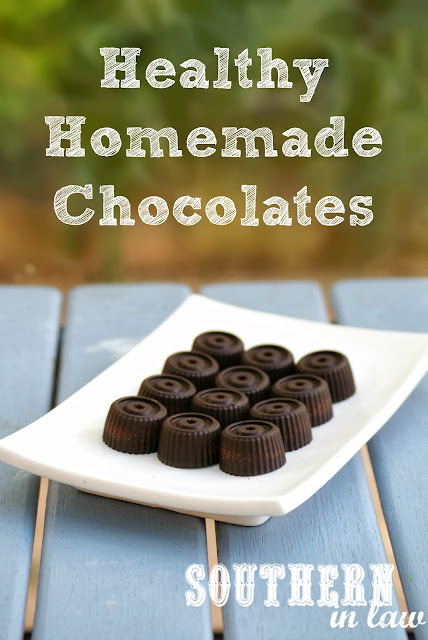 But little did I know, that coconut sugar that didn't dissolved made these homemade chocolates have a delicious chewy caramel-like flavour and texture. Before I knew it, the batch had disappeared.... And it was yours truly who was the only one eating them. Naturally, I knew I needed to share the recipe. These are very dark chocolates so they're not for the faint hearted. They're full of dark cocoa flavour and so delicious to this dark chocolate lover, however, my milk chocolate preferring family weren't so keen. If you're a dark chocolate fan, I'd say you NEED to try this, but if not hang tight because I'm coming up with an alternative for you! 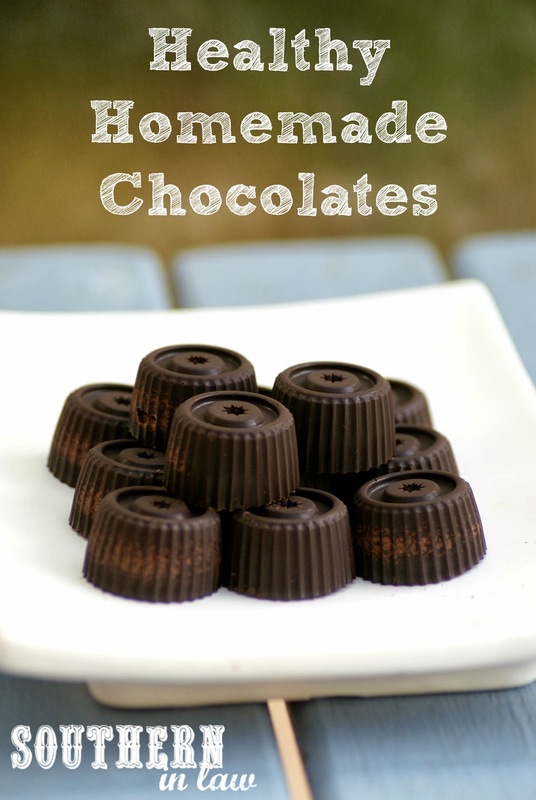 These homemade chocolates need just 3 ingredients and they're ready in no time at all! So if you're keen, let's get onto the recipe! Place all of your ingredients into a heat proof mixing bowl. Once your water begins to heat and slightly simmer, turn the best down to medium low and place your mixing bowl on top of the saucepan, making sure the water doesn't touch the bottom of the bowl. Stir together your chocolate ingredients until incorporated and take off the heat. Carefully pour your mixture into chocolate moulds (or a small baking tray lined with baking paper) and then place your filled moulds into the fridge to set. Once set, pop them out of the moulds and store them in the fridge in a zip lock bag. But tell me, are you a dark chocolate fan? Or do you prefer milk/white/no chocolate? Don't worry that Google Reader is closed, follow Southern In-Law on Facebook, Twitter, Instagram, Pinterest, Bloglovin and Feedly. You can also sign up to Southern In-Law's Weekly Newsletter here. In general, chocolate is too sweet and creamy for my palate, not to mention I'm usually left with a stomach ache from the milk and sugar. But when it comes to dark, dark, natural chocolate, I could eat a lot of it. Ill have to try these out! Dark chocolate definitely! These days I only really eat/use cacao, but I wouldn't say no to these! yum! They're delicious - and you could use cacao instead of cocoa if you like! Hi Jessica, I'm not sure how it would work as I personally don't use any artificial sweeteners but you could definitely give it a try. I don't think you'd get the same caramel like taste or chew though. Okay, wow, I didn't realise that Stevia was artificial, I thought it was plant based, thankyou ! Hey Jessica, it is plant based somewhat, however, it is manufactured and has had some sketchy findings in research. I've had family members get really sick from stevia and other artificial sweeteners so I keep well away. Can't believe there are only 4 ingredients in these. Perfect! I'm also a dark chocolate lover. It's perfect after meals, whereas milk chocolate makes me so thirsty. I've never used coconut sugar. Is there much of a difference between it and, say, raw cane sugar? I know right?! Needless to say when I first thought of trying out the recipe, I wasn't sure how it'd go. But it was a huge success! These look great, I'll have to make them asap! Maybe a stupid question, but can you get coconut sugar at the supermarket or do you need to go a health food store? These look gorrrrgeous, Kristy!! I'm hands down a dark chocolate girl and don't mind milk/white chocolate here and there, but I can't have too much of those or I don't feel so good. Dark chocolate feels more satisfying and decadent to me! Oh i'm the same, dark chocolate I'm fine with but sometimes more than a little white or milk chocolate makes me queasy! Thanks for your reply Kristy, I ended up just getting it at the health food store because I was due for a trip there anyway, but I'll definitely have to suss out my local IGA next time. By any chance can I make White Chocolate without using cocoa butter? Any substitute for Cocoa butter? because It's no where to be found in Sri Lanka. There is nothing better than reading your comments on our posts! Let us know what you think of this post! I'm Kristy, twenty-six, a coeliac, major bookworm and married to my very own Southern Gentleman. We've gone from 10,000 miles apart to right beside one another - finally home in Australia together. Southern In-Law covers everything in our lives - from our passion for healthy living to our journey of life, love, our wedding, allergy friendly recipes, book reviews, home decor, travel, a sprinkle of fashion and beauty and so much more - join us for the ride! Find out more about us. and discover how we met whilst on opposite sides of the world. The SIL Weekly Wrap Up! Have a look at our Recipage - or if you're on a Mobile Device, try browsing our Pinterest Board as you'll find our recipes by category, complete with images. Get the latest Southern In-Law posts sent to your email!